A vast number of guidelines have been set up to regulate accessibility and conformance to standards of web pages. However, it is a fact that the percentage of fully accessible web sites is still low. When designing accessible web portals, knowledge of technologies and a good familiarity with interpreting guidelines are certainly required, but other factors have to be considered. 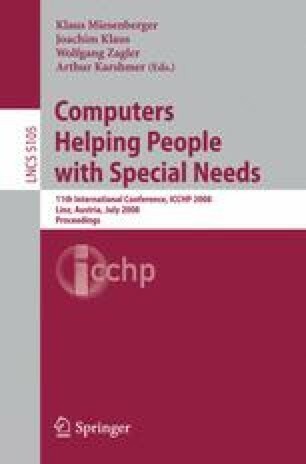 This paper describes the process of implementation of the web site of the e-Inclusion Lab research group, using an Open Source Web Content Management System, and hopefully offers an overview and constitutes an example of good practice in how accessibility can be made mainstream in a research portal. The experience revealed that key factors for mainstreaming accessibility also include the acceptance of the overall solution by content authors and the system administrators.